Show Icegram Popups and Messages On Any Site Now! Show Icegram Campaigns On Non-WordPress Site! We love the way WordPress users have accepted us and shown us so much love in such a short while.. But what amazes us is the amount of requests we received from non WordPress fellas! A lot of people have been writing in to show Icegram campaigns on non WordPress sites. Many want to show Icegram like popups on their Joomla sites. Some on Magento. Some want to show Icegram’s action bars on Drupal. Some have asked to show it on all their sites! At first, we thought of ignoring these requests and concentrating on WordPress. But looking at the magnitude of requests we kept receiving, we knew we had to suffice the non WordPress market sooner or later. Building a native solution for multiple platforms would be time consuming. So what’s the “minimum viable solution” we can create? What’s the main problem we want to solve? You install Icegram Remote addon on your main WordPress site (where you also have Icegram and other addons). 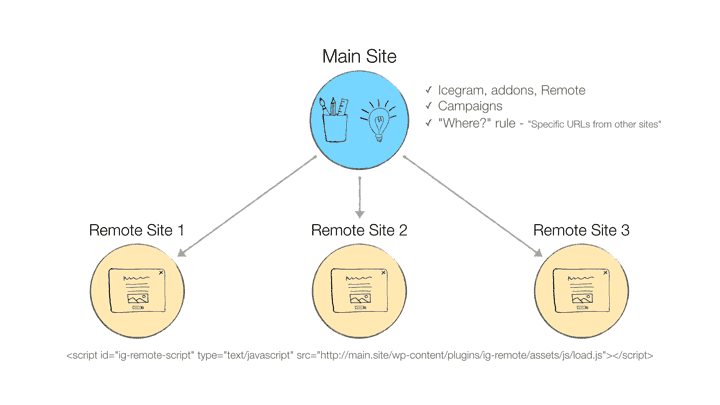 Configure a campaign to show on remote sites – add remote URLs where you want to run this campaign. That’s it! Sit back and watch the results now! Since Icegram Remote follows this approach, you can show Icegram messages on any website. The website may be powered by WordPress, Joomla, Magento, Drupal, any other CMS / ecommerce solution.. or even static HTML pages. Icegram Remote allows wildcard based remote URL targeting, so you can easily configure exact pages you want to show a campaign on – or even target full sites. So the entire targeting and showing process becomes effortless. Another great benefit is that you can manage all your campaigns from a single place. Your campaigns may be showing on other WordPress or non-WordPress sites, but you can design and manage them from your a single WordPress setup. You get total control on all Icegram messages as usual. So in effect you are managing campaigns on multiple sites from a single page! Enough talk! Now some action! BTW, there’s an introductory discount on the addon! So if you want to buy it, now is just the perfect time! How to install Icegram and Icegram Addons for WordPress?